Gone are the days when a third or secondary ear piercing was considered "out there," as ears peppered with numerous mini hoops, studs and trinkets have become more and more commonplace. Even Olivia Palermo, the ultimate poster girl for refined taste, has a piercing through her cartilage. A heavily decorated ear isn't just for rebellious teens. The multiple-earring trend shows no sign of slowing down this year, as the fashion experts at Lyst have noticed over the past six months an acceleration in search for earrings for specific piercings and places on the ear. If you want to curate your own ear party, Lyst has some interesting insights into how the multiple-earring trend is moving this year. Where should you get pierced? 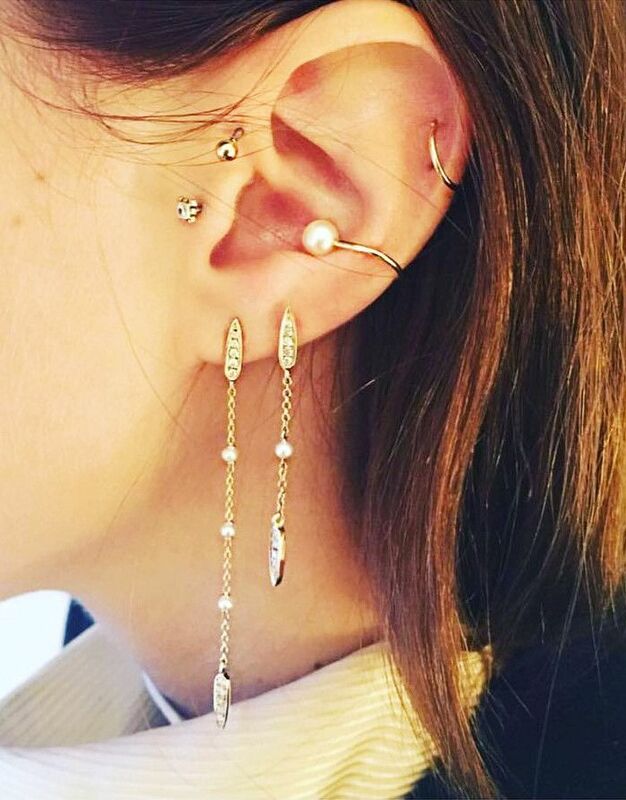 What earring should you choose for your initial piercing? Which brands should you play with when the piercing has healed? Thanks to Lyst's data, we have all the answers below. Scroll below to discover the new rules for your ear décor this year. Lyst notes that now people are searching for earrings for specific parts of the ear. So where are the most popular spots now? Over the last six months, the conch saw an 283% increase in searches, followed by the tragus with 232% and the helix with an 120% increase in jewellery searches. If you don't know your conch from your tragus, see this handy ear piercing chart. When you get a piercing, you normally have a choice of earring, so should you select a gold or silver stud or hoop? According to Lyst, gold earrings come out on top, as they receive more visits than silver or coloured items by three to one. Lyst notes that the most searched brands are the ones that create delicate styles made for stacking. The top three on Lyst are I+I, Jezebel London and Maria Tash. Shop our edit of the best pieces from each label below. Want more jewellery updates? The mismatched and single-earring trends are set to be HUGE this year, and we've found the nine best pairs.